Jihad Deyab, a former prisoner of the notorious Guantanamo Bay detention center and now a resident of Uruguay, has voluntarily submitted himself to the process of force feeding, which is used on the detainees in the prison who stage hunger strikes, to show the suffering inmates have been undergoing since the prison opened 14 year ago. MOSCOW (Sputnik) — The Syrian told Sputnik in front of the US Embassy in Montevideo that he wanted to "send a simple message that the people of Guantanamo suffer every day." Dressed in an orange jumpsuit that belonged to one of his fellow Guantanamo detainees and assisted by a nurse, Deyab was tied to a chair and force fed. Andres Contreis, a member of the Witness Against Torture group, explained the procedure of force feeding to Sputnik. The prisoners are first forcibly removed from their cells by a group of six soldiers. They are then tied and have their blood drawn. Finally they are taken to a specifically designed chair where a nasogastric tube is inserted into their stomachs through the nose. Rosario Piedracueva, a nurse who voluntarily participated in the demonstration, explained the great risks associated with force feeding. "You can break the esophageal wall, a wall of the stomach or nasal septum," Piedracueva told Sputnik, adding that the risks were elevated in the case of prisoners as "they are struggling, they [are fed] against their will." The nurse administered a numbing medication to Deyab before beginning the process to make it less painful, something that does not happen in prison. "We must ensure that the tube reaches the stomach," Piedracueva said to the people watching the demonstration, including journalists. When the nurse inserts the tube, Deyab begins twisting, even though his hands are tied. People start turning away, unable to watch. "When the tube is on its way to the esophagus, it causes nausea, which can divert [the tube] towards the lung," Piedracueva explained. Deyab begins to gag, his face reddens, it seems as if he is drowning. He asks Piedracueva to stop, spitting blood. 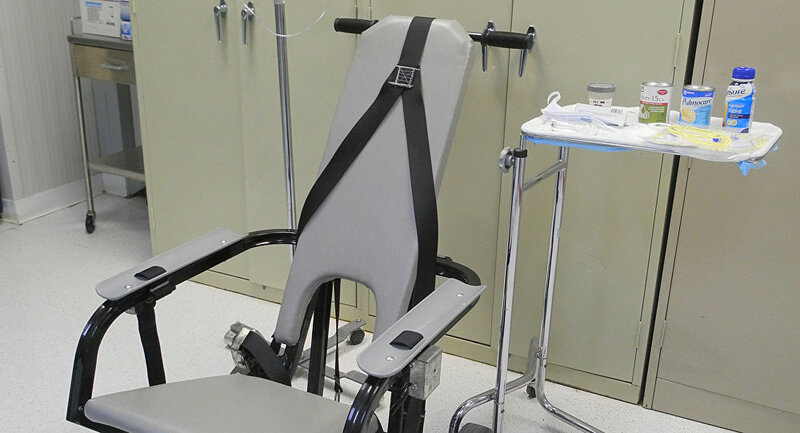 On the second attempt the tube reaches the stomach, and the same liquid nutritional supplement as is used in Guantanamo is administered to the former prisoner. "Imagine how much people suffer when going through this every day, twice a day for 14 years," Deyab says after the painful procedure was over. Monday marks the 14th anniversary since the first inmate arrived in the Guantanamo Bay detention facility. Despite US President Barack Obama’s promise to close the facility prior to leaving office, 103 prisoners still remain there.